There have been advertising records made in every country, for every product and in every musical genre. I find it a miracle that there is hardly any of this material available on CD’s. Not only is are some great songs made in this forgotten continent of the wonderful world of music, many of these songs also have a great historical and nostalgic value. Today I received a CDr from David N. with British advertising records from the late 60’s and early 70’s from his collection. Most of the songs were new to me, and there was a lot of good stuff on this CD. I was especially pleased with two songs made for Airline companies. Every airline company has at least made one advertisement record. The KLM has made more than ten records that I know of. The music on most of the airway ad records is easy listening close harmony jazz with a touch of folklore. Not really what I listen too when I want to listen to music, but it is genre on its own that deserves being mapped and made available. And the sleeves are often beautiful, as with many advertising records. Because these airway records where mainly used as souvenirs for the customers, they have an international appeal and even the exotic countries come up with songs in English. 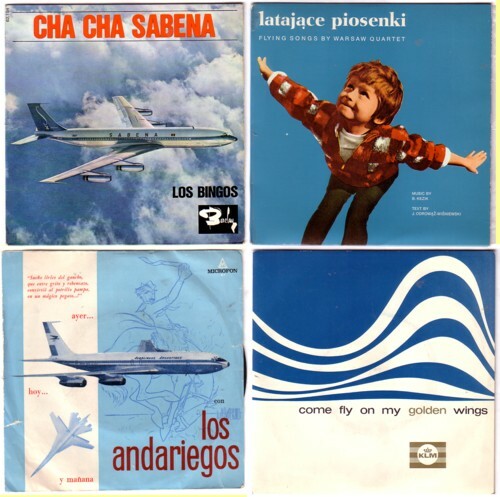 Here is Karel Hala & the Lubomir Panek’s Singers and Swingers with Your highway is the sky, recorded for the Czechoslovak Airways.